Quarantined from the outside world and segregated within, alliances are made and relationships are shattered, as everyone fights for the truth - and for their own survival. 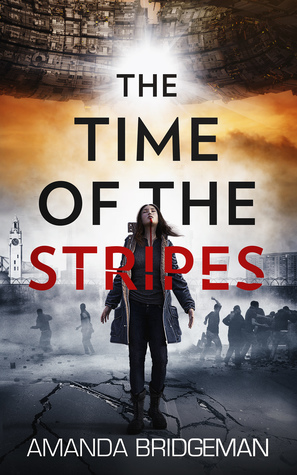 The Time of the Stripes is the new alien invasion novel from Aurora Series author Amanda Bridgeman. I know Bridgeman for intense character and action driven science fiction set locally and by locally I mean on earth and other locations within our solar system. 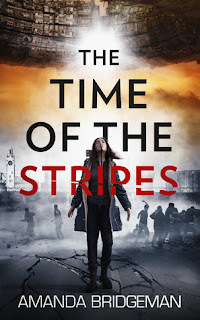 The Aurora Series is grand in scope of setting and character through a long plot arc targeted to reach nine novels and The Time of the Stripes takes the same high level of action and depth of the human spirit and jams them into nine days in a single small town. The setup is what I’ve come to expect from any tale in which a cross-section of society is presented as a familiar yet potentially explosive mix of people forced together in terrifying conditions. We all know them. They're our friends, family and neighbours. My bar for a well put together cast in the face of disaster sits high and Bridgeman nails it. I loved that each of the main characters remained true to who they were throughout the story. Also, Bridgeman has no qualms about displaying the dark and the cold complexities of her villains and I wasn’t disappointed with the mix of queasiness and apprehension with which she rewards her readers when her antagonists are about. While The Time of the Stripes is set in a fictitious community and documents events we haven’t seen the likes of in real life, Bridgeman takes the intimacy of a small town invasion and uses it to highlight many of the social issues for which we feel very strongly. In spite of being able to know what is right and good, it’s all too easy to see how a small town physically cut off from the outside world and facing the extreme unknown can descend in to discrimination and violence. This microcosm of the bigger world in general is all the more scary when put in terms of regular people we can all relate to. As I’ve come to love from her books, Bridgeman builds tension through the action of her characters and points all the pieces of her plot toward a finely explosive finish. I also love that each scene is the next piece of the story and we don’t find ourselves bogged down in retelling of parts of the story from different points of view. Every piece has a purpose in driving the story as a whole. This is the kind of smart scary story that gives me a book hangover. I recommend you pick up a copy and get ready for the ride.